So you wanna be a bartender? 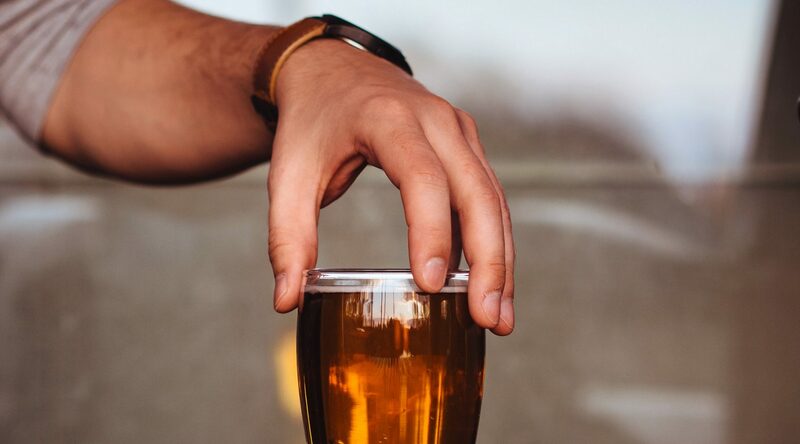 Whether it’s a part time job to get you through school or you’re making a career out of slinging beer, here are a few pitfalls to avoid. Based on a true story. I wish I had made it all up, but I’ve seen it far too often and I bet you have, too. From saggy pants to checking your phone while taking an order, here are the Must-Don’ts of Bartending 101. Thanks for the shot of mojito in my cup of ice. There are so many reasons to not do this. For one, your hands were just all over that glass and now you’ve contaminated the ice. 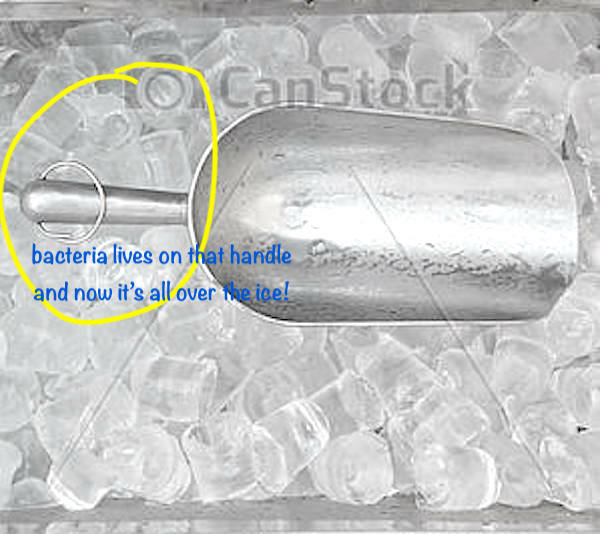 Second, if the rim of the glass chips or the glass breaks, there is going to be glass shards all in the ice. 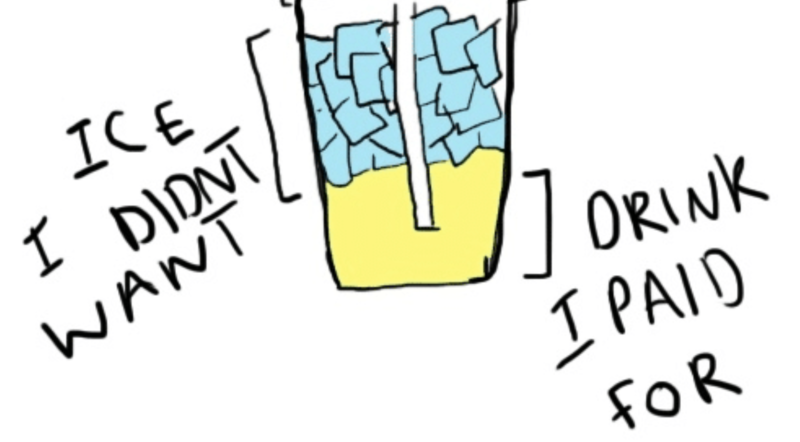 …and swallowing shards of glass is almost as painful as bad service. Almost. Did someone order a Double Staph Infection & Tonic? Mr. Bartender, you have just put someone’s order in, touched the debit machine, high-fived that man who has had one too many and thinks no one saw him digging for gold and now you want to touch the ice handle and put that ice in MY drink? You might as well just mix my drink with your finger. Thanks for my Spiced Rum & Coke with the side of E. Coli. And to complete that last thought, when your bartender makes 0 effort to be sanitary. Please wash your hands, Mr. Bartender. 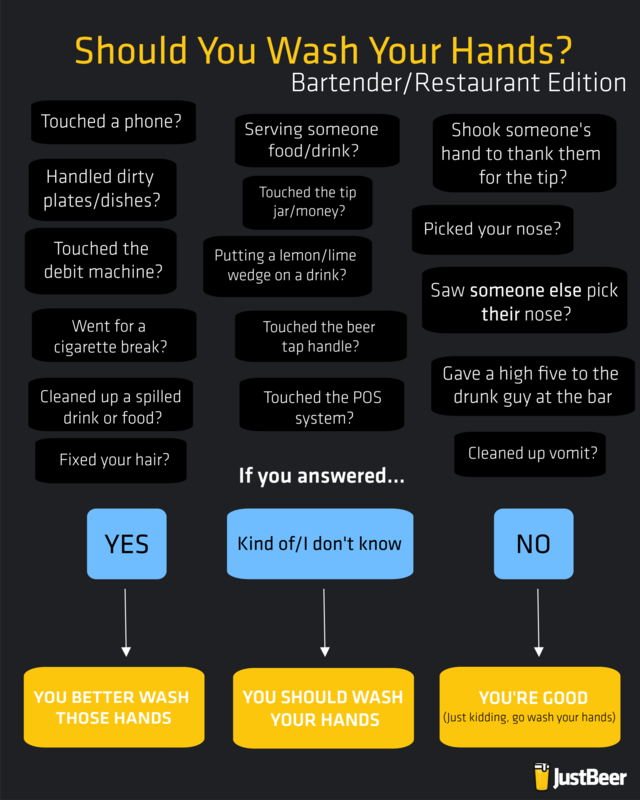 Because this is so important, the JustBeer team put together a chart to help bartender’s/food service workers determine when they should wash their hands. This seems pretty self-explanatory, but remember when I said this was based on a true story? I literally saw my bartender do almost all of the above and NOT wash his hands. We’ve all experienced it. The other night, I watched my bartender do 10 unimportant things before taking my drink order, including checking his phone that he was just on – at the front door, while having a smoke, when I walked into the bar. 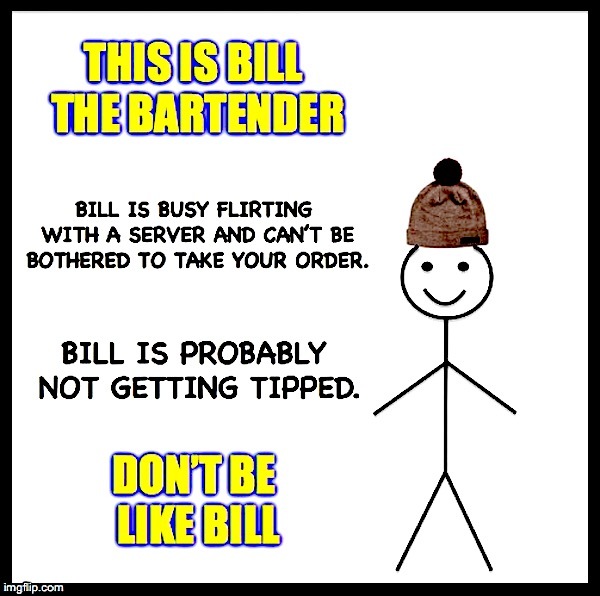 I made this meme about my bartender. His name was probably not Bill. Or maybe it was, I don’t know. Regardless, don’t be like him. Yes, this actually happened to me.I was mid sentence, about to choose my side dish when Dirtyhands McBoxers decided to take his phone out of his back pocket, see who was calling, think about whether or not he wanted to answer the call, then put the phone back in his pocket and finally look back at me to finish taking my order. Piggy backing on the previous point, please put down your phone. I’m not saying you need to cut yourself off from the rest of the world for 6-8 hours (let’s be realistic), but if you at least keep your phone off the floor you have a better chance of paying attention to your guests because you’re not constantly checking texts or social media. There is so much bacteria on your phone! Let’s talk about germs again for a second. I couldn’t help but notice after he put his phone back in his pocket, he then took my order, made a couple of drinks and put away clean glassware. You and I both know he takes that phone into the bathroom with him. Let that sink in. Honestly, I haven’t tried that one yet, but Suzie loves it. We make our BBQ sauce from scratch and it’s got a bit of a kick to it. It’s also a pretty generous portion, so if you’re hungry and you like it spicy that’s a good choice. I’ve probably served (not “sold”) about a dozen of those in the last hour so it’s pretty popular. We source the meat locally and make all the sauces in-house. Actually, my favourite is our slow roasted chicken with a side of mashed potatoes and slaw. Delicious. When the Bartender serves your drink by the rim of the glass. And especially when that drink is served without a straw. If you put your grubby hands anywhere near the top of my pint glass where I put my mouth, I’m sending it back. At the end of the day, being sincere and human with your guests while building a rapport is wonderful. Just understand that there is a line of professionalism that should exist no matter how casual the restaurant is.